Represented by the blue icon with the smiling face, the Finder is home base for your Mac. You use it to organize and access almost everything on your Mac, including documents, images, movies, and any other files you have. The Finder offers many ways to work and organize your files, so getting access to your most important items is quick and easy. If you like working in a folder structure, you can do that. With Mac OS X, it’s easy to create new folders and subfolders, in your home folder or on your desktop, and then organize your files as you like. If you’d rather avoid folders, use All My Files, where your items are organized for you and you’ll find a quick, efficient way to browse all your information. What’s in All My Files? Color labels make it a snap to quickly identify all files of the same type—for example, all documents related to a work project, or all pictures of a person or place. 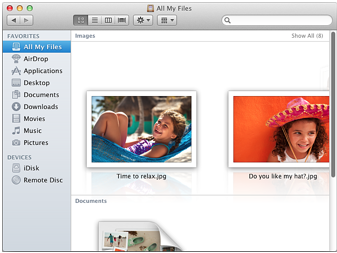 To color-code items, select an item in a Finder window, and then choose File > Label and choose a color. You can customize the name assigned to each color label in Finder preferences. You can change how you view Finder windows to suit your working style. For example, you don’t have to view your items in a list—Cover Flow lets you flip through your files and folders visually. If you choose icon view, you can pick a size for the icons, and even add a color or picture to the window background. There are many ways to view Finder windows—find the one that suits you best. There are dozens of ways to make things easier to find on the Mac. Learn how to put a stack in the Dock, or an alias in the Finder window sidebar. Use Spotlight comments and Smart folders. And much, much more.